What is a visitors monitoring record form? A visitors monitoring form enables co-ordinators to monitor the welfare of those detainee's being visited and to measure the value of visiting. The form requires visitors to give a score between 1-10, which reflects the extent to which a detainee is engaged with a visit. A score of 1 would be given if the detainee did not come to the visits room for the visit and 10 would be given if the detainee had fully participated in the visit, both physically and emotionally, and the visit had visibly comforted the detainee. What happens to your monitoring record form? Visitor monitoring forms are regularly evaluated and provide valuable information about the impact of visiting for those who are detained under Immigration Act powers. A number of feedback forms show a progression from detainees being suspicious or apprehensive of help to being fully engaged in the visitor-detainee relationship. Many visitors record positive engagement scores and noted a wealth of positive comments from detainees on the experience. We thank all of our volunteer visitors for their time and dedication. Levels of Engagement shown by detainees. Analysis of records from 19 visitors from January to July 2012. One of our visitors has been visiting a gentleman for approximately a year and is still visiting him now that he has been moved to another centre. 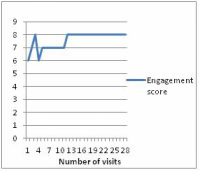 The graph below shows the engagement scores given by the visitor and we can endeavour to explain some of the fluctuations based on his written responses. Over the first three month period the visitor described how the detainee was “still too suspicious to open up, we are working on it!” and that in the third month of visiting the detainee suffered the loss of a loved one which “set him back a bit”. This goes some way to explaining the perceived fluctuations in the detainees’ engagement and reasons for the detainee not fully engaging with the visitor until later months. The visitor has to earn the man’s trust in the early meetings. Another visitor who visited a gentleman for 6 months noted a consistently high engagement score increasing from 8 to 10 in the following months. The visitor noted that the detainee had made a birthday card for their partner and was undertaking several activities whilst detained. The visitor noted in the second month of visiting that he “is always so pleased to see me & I get lots of thanks for visiting.” Feedback both positive and negative allowed the coordinators to identify those that were most vulnerable to detention.